Over the summer P started trying to ride her bike. 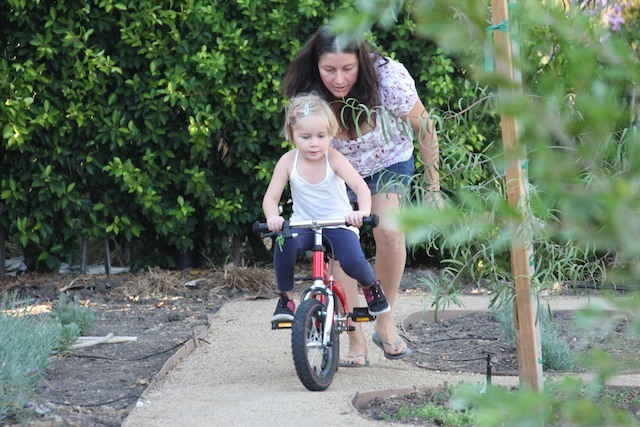 First she got on her balance bike. She was determined to get it down, and she did in about 3 days. She wanted to ride everyday. She gained so much confidence she was going down steep hills and ramps and loving it. She learned to use her hand brakes and then asked for the pedals. I was proud of her determination. I had the pedals put on the bike. Suddenly it got hard and uncomfortable. She didn’t want to ride it anymore. She didn’t even want to try. This is a part of P’s personality that I will have to work on. When she knows she can do something she has unbelievable determination. But, if she has even the slightest thought she can’t she won’t even try. This is where the bike riding is not about the bike. It’s about her getting past her fear of failure. It’s about not saying “i can’t” before even trying. This is a huge building block for future success. For three days I pushed her to try. I told her she couldn’t give up and she had to at least get on and give it a try. She did get on but I could tell her expectations of success were determined in the first 30 seconds. When she did try she rode her bike just fine and every single time it was fear that stopped her. It’s amazing how fear alone can make us fail. When P started trying to ride with pedals she was riding great for about 30 yards and then she pedaled in the wrong direction so the bike came to a quick stop and she fell over. I think that was the one act that set the tone for riding with pedals. I really wanted her to push past her fears. I wanted her to try because she was so so close to realizing what she wanted to accomplish. The neighbors saw her trying to ride and me pushing her. I saw the looks on their faces. I could see what they were thinking. I was trying to get my 3 year old to ride a bike. What an accomplishment for me. I could care less if P never rides a bike. I do care if she doesn’t try. If she doesn’t get past this block in her head it worries me. This is the kind of stuff that determines whether she will continue giving up every time something gets hard. Life is full of hard stuff on the road to amazing accomplishments. I don’t expect the neighbor with a drug addict/dealing son and a 7 year old who can’t even read a fortune cookie to even begin to comprehend any of this. Their judgment is still annoying. Dave even got in on the bandwagon and tried to motivate her to try. We finally set the idea aside. But every time we saw something related to not giving up we pointed it out to her. We watched Kung Fu Panda. Po didn’t give up even though he was afraid! Dragon Warriors don’t give up! Are you a Dragon Warrior P? Yes I am! We tried again. At least she tried. To me, that’s what counts.